2. One of the men sent by King Josiah to consult the prophetess Huldah concerning the finding of the "book of the law" (II Kings, xxii. 12, 14); son of Michaiah. In II Chron. xxxiv. 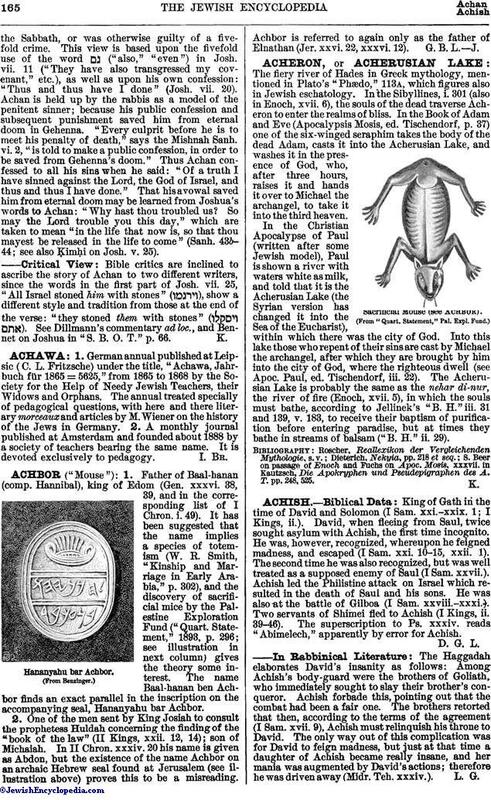 20 his name is given as Abdon, but the existence of the name Achbor on an archaic Hebrew seal found at Jerusalem (see illustration above) proves this to be a misreading. Achbor is referred to again only as the father of Elnathan (Jer. xxvi. 22, xxxvi. 12).